Wow! What a kid! 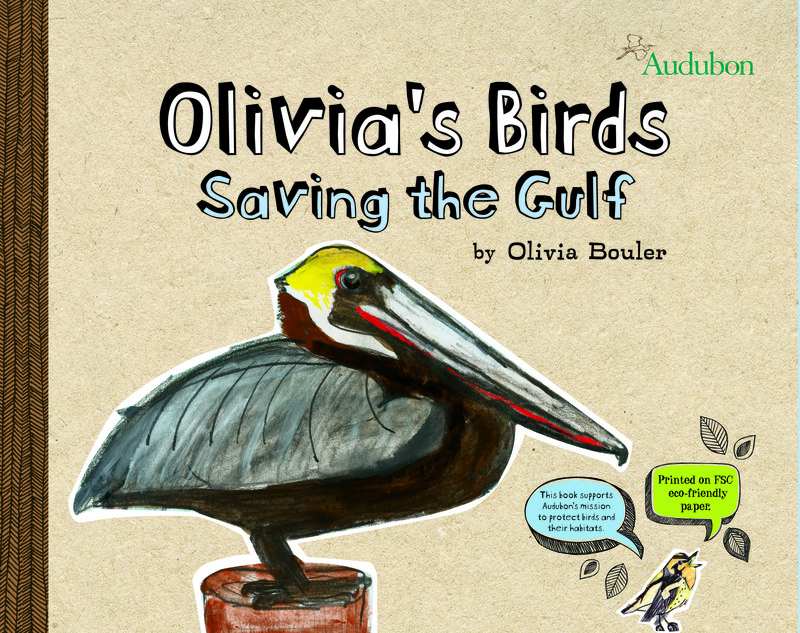 Olivia Bouler is an artist, ornithologist, fundraiser, and now published author at just eleven years of age. Wish I was as cool and effective in my tween years. Catching nationwide attention for her Save the Gulf Campaign (read: hang time with Kathie Lee Gifford, Kevin Jonas, and Congressman Steve Israel), Olivia raised a remarkable $150,000+ dollars for the Audubon’s Gulf Oil Spill recovery efforts by giving each donor a hand drawn and colored illustration of a bird. 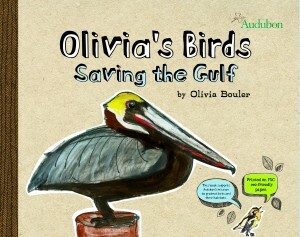 She made over 500 drawings, several of which made their way into Olivia’s Birds: Saving the Gulf, as a thank you perk for each donation. The book is broken up into two parts, the first being a warm up for the second. Readers get the full-spectrum low down on all sorts of winged animals in the sections: Discovering Birds, Everyday Birds, Birds in Flight, Birds that Live in the Woods and Near the Water, Weird & Wacky Birds, Fierce Birds, Bird Beauty, and Endangered & Extinct Birds. Each section is a two-page spread with Olivia’s artwork and age-appropriate text. Great vocabulary words abound: camouflage, dull, nape, civilization, aerodynamically. The latter half of the book focuses on Olivia’s learning of the Gulf Oil Spill, the development and execution of her campaign, and an outline of “If I were President of the U.S.” objectives. Vegbooks readers will love that Olivia encourages folks to adopt rather than buy animals, recycle, compost, and feed birds. This book is a winner on multiple fronts: it inspires its readers, supports Olivia, an ASPCA Kid of the Year winner, and the Audubon’s mission to protect birds and their habitats, and encourages the continued printing of eco-friendly children’s books. I received one of Olivia’s hand drawn bird pictures – of a pelican – and its beauty and inspiration are amazing. Olivia is gifted far beyond her years, as is her maturity and dedication to making this a better world. Please continue to support Olivia’s efforts, especially by buying this remarkable book.